SHANGHAI, CHINA and IRVINE, CA--(Marketwired - Jun 23, 2016) - Brite Semiconductor, Inc. (Brite), a leading ASIC/SoC design and turnkey solution provider, today announced the collaborative development of an industrial machine-to-machine (M2M) system on chip (SoC) with Semitech Semiconductor, a leading provider of power line communications (PLC) solutions that enable the transformation of the electricity grid into a smart grid. This SoC is designed to support M2M communication in the global industrial and energy transmission market via PLC/wireless modes. Backed by a successful track record that includes numerous ASIC designs, Brite has developed a Cadence Tensilica-based communication core architecture SoC that integrates DSP, memory, PLC AFE, RF transceiver and high-speed interface IPs with DDR and USB. This provides a market-defining dual-mode PLC/wireless communication system to achieve interactive M2M communication. This SoC will be manufactured using an advanced process with strategic partner SMIC, and will contain Semitech's integrated PLC/wireless IP. The resulting product will provide high reliability and quality, ensuring it can be adopted by a broad range of industrial applications. Semitech develops a dual-mode communication core (DMCC) for PLC/wireless and will apply this IP to Brite's SoC-based system. By leveraging its abundant experience in M2M communication and expanding its proven PLC core, Semitech provides a total DMCC solution (including architecture, digital modules and algorithms) that can simultaneously support reliable wireless and PLC connectivity for the M2M market. "This collaboration represents an important milestone for Brite, as designing an industrial SoC product for the emerging M2M market has been a goal of ours," said Jerry Ardizzone, senior vice president of worldwide sales and marketing for Brite Semiconductor. "The primary application for the Brite and Semitech collaboration will be smart meters, and we will develop additional solutions for broader industrial applications including smart home, smart grid and automotive." "The next evolutionary step for smart grid applications is to move toward heterogeneous PLC/wireless networks, while accommodating aggressive cost and power budgets," noted Zeev Collin, CEO of Semitech Semiconductor. "Our existing PLC architecture and the extensive experience of our team in narrowband communication across different media make it possible to take this step. Partnering with Brite puts us at the leading edge of the M2M market and will ensure that we yield a superior product." Brite Semiconductor is a leading ASIC design services company providing customers with ASIC/SoC chip design and manufacturing services. The company was co-founded by Semiconductor Manufacturing International Corporation (SMIC) and Open-Silicon, as well as venture capitalist firms from China and Silicon Valley. As strategic partners, SMIC provides Brite Semiconductor strong technical and manufacturing support and leverages Brite's design capabilities in test chip development. Targeted at advanced processing nodes to 28nm with high-end SoC design services, Brite Semiconductor provides customers with flexible design and turnkey services. Brite offers customers RTL/netlist to seamless chip delivery with enhanced economic value for low-risk solutions. For more information, please refer to the Brite Semiconductor website at www.britesemi.com. Semitech Semiconductor is a fabless semiconductor company leading in the development of Narrowband Power Line Communication (N-PLC) semiconductor devices that enable the transformation of the electricity grid into a Smart Grid. Semitech's products are used in machine-to-machine communication and IoT applications such as smart meters, street lighting, solar panels and remotely monitored and controlled industrial equipment -- thus providing a core technology to implement a worldwide communications network over the existing power grid. Semitech operates in Southern California and in Melbourne, Australia. For more information, please visit www.semitechsemi.com. 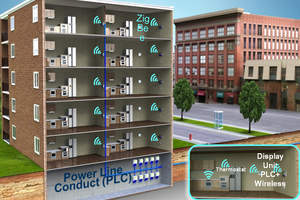 Narrowband PLC and low-power wireless technologies are the keys to the heterogeneous smart grid networks of the future.